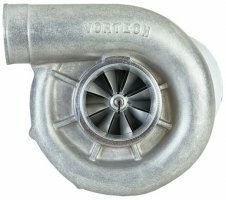 Vortech 2003-2004 Mustang Cobra V-2 T-Trim Tuner Kit Satin [4FR218-140TSQ] : Supercharger Superstore, Your Online Source for Vortech Superchargers, Paxton Superchargers, Procharger Superchargers, Magnacharger Superchargers and Techco Superchargers! This tuner kit replaces the OEM roots-type supercharger/charge cooler package with a Vortech V-2 SQ T-Trim supercharger/charge cooler configuration. V-2 T-Trim supercharger with 8-rib 3.33" pulley. This will produce approx 14-16 psig depending on engine modifications. Other pulleys are available for up to 25 psig. 8-rib supercharger drive design allows for maximum belt traction and stability. Maintains the factory automatic drive belt tensioner and features the greatest amount of supercharger drive pulley wrap possible. Also includes the provision to tension the belt manually for high boost and racing applications. Integrated dual-pass air/water charge cooling configuration, which features a larger capacity water storage reservoir. The OEM charge cooler water circulation pump and front mount heat exchanger are maintained. These systems do not come with fuel management, engine management, or intake manifold which must be installed for proper vehicle operation. Battery relocation is required. Battery relocation is necessary and is not included. Possible fuel pump and injector upgrade depending on desired engine horsepower level. Custom ECM calibration based on specific vehicle and engine modifications. Race fuel is strongly suggested for boost levels above 17 psig.